Buxton, W. & Moran, T. (1990). EuroPARC's Integrated Interactive Intermedia Facility (iiif): Early Experience, In S. Gibbs & A.A. Verrijn-Stuart (Eds.). Multiuser interfaces and applications, Proceedings of the IFIP WG 8.4 Conference on Multi-user Interfaces and Applications, Heraklion, Crete. Amsterdam: Elsevier Science Publishers B.V. (North-Holland), 11-34. We present an introduction to the multimedia infrastructure of Rank Xerox's EuroPARC research facility. After a brief introduction to EuroPARC, the rationale and requirements of the infrastructure are summarized. We then provide an overview of the system, followed by a description of some specific examples that illustrate how the initial system was actually used. Finally, we present a fairly detailed description of the system's implementation. The system discussed is an integration of distributed workstations and audio, video, and communications equipment. The intention of our presentation is to document our experience in such a way as to benefit others in the field. Hopefully new ideas will be stimulated from hearing about our excursion into this relatively uncharted territory, and others embarking upon research in this area may benefit from our experience. EuroPARC is a research facility established in 1987 in Cambridge England by Rank Xerox Ltd. The lab, with a staff of about 25 people at full strength, has a mandate to undertake research in the area of Human-Computer Interaction. As its name suggests, EuroPARC has a close affiliation with Xerox's main systems research centre, the Xerox Palo Alto Research Centre (PARC). EuroPARC is a satellite lab of PARC, established to benefit from, and participate in, the extensive work in HCI being undertaken by European researchers. EuroPARC's approach to studying HCI has two distinguishing features. First, it is concerned with technology in the context of groups and organizations more than the limited case of individual users. Consequently, issues such as collaborative work, meeting support, and the design and integration of technologies into physical and organizational environments are of special interest. Second, the lab is concerned with developing a better understanding of the process and methodology of design. It is especially concerned with the issues of effectively involving users in the design process in organizational settings. In order to support these activities, a significant investment was made in the laboratory's infrastructure. A key part of this is what we call the integrated interactive intermedia facility (iiif). We believe that our motivation and experience in developing iiif may be of interest to others. Consequently, we offer the following documentation of our early experiences in setting up the facility and bringing it to use. The objective of iiif was to support and encourage EuroPARC's research. It was intended to provide basic research tools, such as to collect, analyse and document data. At the same time, iiif was to provide the basic glue that would permit us to create, explore and study the distributed and shared work environments that were the domain of our research interest. Group Support: A key demand of iiif was that it support group activities. In this regard, it was important that it provide facilities to support collaboration where participants are in the same physical location, or to help support telepresence where they are in physically distinct locations. Data Collection: If we were to study interaction, and in particular group interaction, it was important that the infrastructure support the collection of appropriate data. Since we wanted to pursue the interaction analysis methodology (for example, as described in Heath, 1986), this meant providing for the collection of audio, video and keystroke data. Data Analysis: To be effective, tools to collect data must be accompanied by tools to support their analysis, such as described by Trigg (1989). Towards this end, iiif needed to support tools to index, annotate, edit, combine and view data of various forms, including audio and video. Support of Multimedia Documents: We wanted to investigate the nature and the range of documents that could be supported in the workplace. In particular, we wanted to provide tools to support the exploration of documents, such as video, which have a temporal component. The system needed to support tools to save, retrieve, index, transmit and edit such temporal "documents." Nonspeech Audio: In addition to video, audio played an important role in our research agenda. In particular, we wanted to be able to explore the use of nonspeech audio cues in supporting telepresence, collaborative work, and multimodal interfaces (Gaver, 1986; Buxton, 1989; Buxton, Gaver & Bly, 1990). Envisionment: An emerging method of interest in user centred iterative design is what is we call envisionment. In the present context, this includes techniques such as the use of video to mock up designs, or the use of video to record actors, and mock environments in hypothetical scenarios. Such envisionment can be useful as the basis for discussing, communicating and exploring design ideas. Formats and Standards: A basic but important requirement of the facility was that it take into account the reality of different video formats and standards. Being in the United Kingdom, we had to support the European PAL video standard. However, we also had to be able to support tapes in the North American NTSC standard, as well a play tapes of various formats. This brief summary provides a flavour of the range of objectives that the iiif had to meet. In the next section, we provide an overview of our approach to meeting these needs. While our functional requirements were rather diverse, our basic design philosophy was that the bulk of these needs could be met via a common core system. Implementing a base infrastructure that would support and integrate a broad range of services such as telepresence, meeting support, documentation and analysis would provide significant economy of effort and, ideally, provide the potential for synergy among applications. Our belief that such a unified approach would work was based on the experience of the Mediaspace project at PARC (Stults, 1986, 1988; Harrison, Minneman, Stults & Weber, 1990). Mediaspace is like an in-house telephone exchange where connections are requested from each subscriber's workstation. However, instead of telephone calls, this exchange supports interconnections among multiple audio and video channels coming and going out of each "subscriber's" office. Building on the Mediaspace model, we cabled the building such that every room was connected to a central location by a number of audio and video cables. At this central location, all of the cables were connected to a central switch, or "A/V exchange." This switch was computer controlled by a central server that could handle requests from any workstation in the building. This room was designed for informal meetings. The A/V is fairly traditional, consisting of audio and video playback, a wall-sized whiteboard, and overhead projection. This basic network formed the core of our system. In contrast to the digital LAN that connected workstations, this star configured analogue audio/video network was anything but tidy. While the technology wouldn't scale up to a larger building, it was available, affordable and it worked. Our interest was in usage, not technology. As long as we could hide the technological inelegance of the implementation from the user, then it was acceptable. We designed two main meeting rooms for EuroPARC. Each has a distinct character. The commons, shown in Fig. 1 is open and casual, and intended to support more informal meetings. The conference room, shown in Fig. 2, lends itself to more formal meetings. Both meeting rooms have double cabling to the central switch, and since a lot of our meetings involve various media, both have a range of A/V gear as standard equipment. Both have projection for 35mm and overhead slides, as well as facilities for video playback. The conference room is equipped with a rear-screen projector that can be used to display video or data from any type of computer in the building. We designed the conference room, especially, as a laboratory for the study of meetings. Besides being instrumented, it is reconfigurable by virtue of its being constructed with a raised floor, flexible cabling, fax, phone, etc. Consequently, it can support meetings as diverse as electronic classrooms, COLAB-like meetings (Stefik, Foster, Bobrow, Kahn, Lanning & Suchman, 1987), and video conferencing. The conference room was designed to support a different type of meeting than the commons, shown in Fig. 1. It has rear-screen data, video and 35 mm slide projection. It can be used for presentations, and also as a videoconferencing room. The antenna-like object on the table is an omnidirectional microphone than can be used for teleconferencing. The room is designed to be easily reconfigurable in order to support other types of meetings, such as Colab-like computer mediated meetings. The environment was also designed to allow us to explore meetings and other interactions where the participants are not in the same physical location. The objective here was to provide the means to explore our ability to support telepresence. The Mediaspace project and Xerox's corporate videoconferencing network (XTV) were our initial points of departure. For our initial efforts, we were happy to restrict our studies to in-house communication. As illustrated in Fig. 3, offices and meeting rooms were equipped with a video camera, microphone, loudspeaker and video monitor. Using their workstation, users could then instruct the server to interconnect the gear in different rooms to support the type of interactions desired. Examples of how this capability was used is illustrated by some of the examples below, such as SharedARK and Buttons. The long-term plan is to link the central switch to the corporate XTV videoconferencing network, thereby affording us desk-top access to XTV nodes world-wide. While this is not yet in place, the infrastructure is designed to accommodate it if and when it becomes available. In the meantime, we have access to an XTV link (45 minutes away) and have performed some initial studies of linking desk-top units to the network. All offices were cabled to a central audio/visual switch that functioned much like a private telephone exchange. The switch was controlled by a server that handled requests for resources from the user's local workstation. In the office, the audio and video lines terminate on a custom wall panel. A typical office would have a camera, monitor, microphone and speaker connected to iiif. Additional lines are available for connecting VCRS, an additional camera, or other A/V equipment. Within the building, the A/V network and the in-office equipment illustrated in Fig. 3 provide the primary tools for data collection. Using these resources, data can be recorded in the central A/V suite (described below), or using purpose-installed equipment in some other room. This is supplemented with a range of field recording equipment (camcorders, portable VCRs and cameras) that can be used off-site or in-house. Experimental sites can be easily linked, and remote data recording and observation is facilitated. The description of the SharedARK experiment, below, gives a good example of this. One room in the lab was equipped with special A/V equipment. This was termed the A/V Suite, and is shown in Fig. 4. The idea behind the suite was that a number of functions could be met with a common facility. These include use as the control room in experiments, special effects (such as picture-in-a-picture), and the editing and analysis of audio and video tape. For example, while one is for synthesis and the other for analysis, the process of generating a video edit list is similar to the annotations that an anthropologist makes during analysis. While it looks like an edit suite, special concern was taken in the suite's design so that it could serve a broader function. In particular, the majority of the resources in the suite can be remotely controlled from other parts of the building, as well as from in the suite. Furthermore, using the A/V network and switch, signals can be routed between the A/V suite and other building locations, such as where a meeting is taking place or an experiment is being run. Figure 4: The A/V Suite. Contains 3-machine computerized edit controller, 2 channel digital special effects unit, audio equipment, and test scope. The equipment can be operated both from within the suite and remotely from workstations in other rooms in the building. The suite is used for video editing, analysis, experiment control and special effects. Our initial idea was that the A/V suite, supplemented with appropriate software, could provide the primary platform for analysis. That way researchers could work in the suite, or from their office over the network. In practice, this approach proved insufficient. First, the time lags involved in controlling the VCRs from a remote office meant that responsiveness was not acceptable in many cases. The reason for these delays was due to the overhead of the "chain of command," which went from the local workstation to the server to the VCR. To get around this, users always had the option to work in the A/V suite. However, those regularly involved in analysis wanted to work from their own offices whenever possible. This situation resulted in an on-going effort to evolve a "lighter weight" approach that would involve placing domestic quality VCRs in individuals' offices, and controlling them directly from the local workstation. Such an approach would compliment, rather than replace the existing configuration. Video documents rapidly became an important form of communication within the lab, and in communicating with our collaborators at PARC. From experience gained early on (in cooperation with Sara Bly of PARC), it became clear that quickly shot clips documenting meetings, talks and demonstrations were a very potent means of communication. A courier service linking sites equipped with a domestic video camcorder and playback machine provides a video mail facility that is as effective as it is inexpensive. By providing computer-controllable VCRs on-line that have auto-locate capability (using time code), iiif has the capability to provide on-line support for video mail and other video documents. This is an area of active research. Some preliminary experience in this direction is discussed in the examples below. The audio tools rely heavily on the MIDI protocol for computer control (IMA, 1983; Loy, 1985). Because of the need for fast response time, this equipment is not controlled by the central server. Rather, it is controlled directly by the researcher's local workstation. In order to accommodate most of what might confront us, we purchased at least one VCR in a range of different formats (U-Matic, VHS, and Betamax). To accommodate different standards, most of our VCRs and virtually all of our monitors are multistandard. Consequently, almost any tape can be brought in, mounted, and played anywhere. Finally, since multistandard machines are virtually unknown in North America, we acquired in-house standards conversion. While expensive, this is one of the most frequently used pieces of equipment. The standards converter serves as an example to illustrate an important aspect of the "social" design that was part of the infrastructure. Right in the initial proposal, it was made clear that one function of our investment was as a "public service" that we could offer to help make links to the local community. For example, the standards converter was on loan to Cambridge University for three months before we had need of it. This helped establish good will and contacts in the video community that gave us access to expertise that supplemented that which we had in-house. 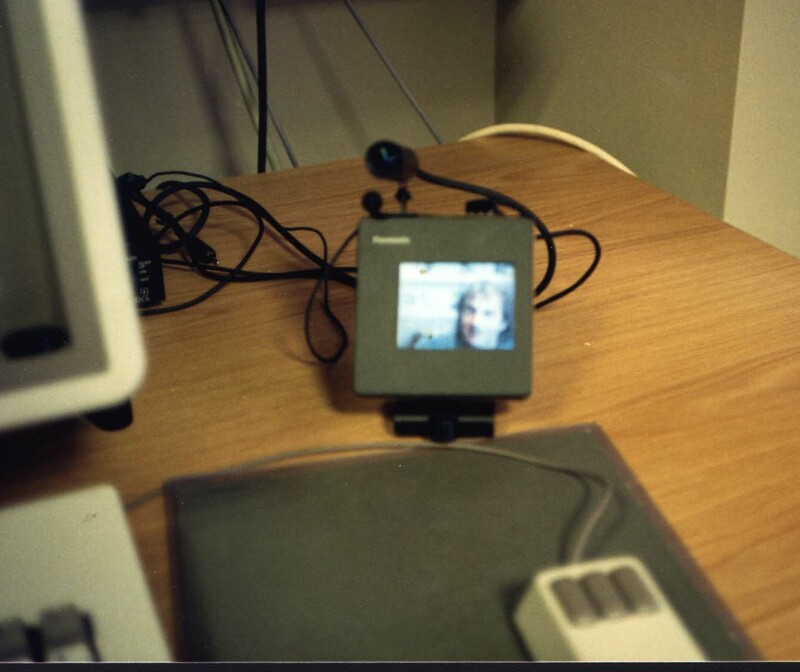 The first use of the Mediaspace-like connectivity was to support in-house desktop telepresence. This is illustrated in Fig. 5 which shows two users communicating over an A/V link. Office to office interconnections are made via the central "switch" or exchange. These are established from the user's personal workstation. By this means, two-way audio and video links could be easily established within the building. The first package that gave easy access to the system was a set of Buttons developed by a combination of Lennart Lövstrand, Alan MacLean and Bill Gaver. The Buttons project itself (MacLean, Carter, Lövstrand & Moran, 1990) was independent of iiif. However, its use in building interfaces to iiif was a good example of the synergy that can result from two projects leveraging off-of one another. Figure 6: Buttons to make connections. Buttons are a bit like soft function keys that can invoke procedures. They provide the user with a simple interface to perform a number of common transactions. They are relatively easy to program, simple to modify and tailor, and easy to distribute. Meet: which sets up a reciprocal audio and video link between the initiator and a second party. Glance: which sets up a short one-way video-only connection enabling the initiating party to "glance" into some remote space, such as another office. The intent was to capture the character of briefly glancing through an open door. Connect: which permitted the user to connect to some resource, such as the television tuner or a remote VCR. Video Walk: initiated a slow "walk" around the building. This provided the user with a background "window" on what was going on, who was in, etc. Video Sweep: initiated a quick sweep through the building, for example, when looking for someone. "Pushing" one of these buttons causes a pop-up menu to appear. This is illustrated in Fig. 7. In the example, the pop-up menu enables you to select who you want to meet with. Figure 7: Activating a button. A pop-up menu appears when a button is selected thereby providing a list of alternative actions. In this case, the list contains the names of people with whom the activator may meet. Buttons were easy to create, install and circulate (they can be sent by email). Therefore, new ideas were easy to implement and test. This rapidly gave rise to a number of insights. For example, the time-sensitive nature of looking into someone's office became quickly apparent. Brief glances (analogous to glancing through an open door) were acceptable, while unconstrained watching was not. The initial server software did not support temporal constraints on transactions. The buttons-based experience quickly prompted an update. From the early days of EuroPARC, video documents were an important means of information exchange between PARC and EuroPARC. Largely initiated by Sara Bly, tapes containing project information and other types of material were sent back and forth by courier. Such videograms supported different types of messages than other media and therefore supplemented, rather than replaced, existing means of communication. For example, through video, EuroPARC staff could "attend" demos at PARC, or observe project meetings. Through videograms, the notion of telepresence was extended to asynchronous as well as synchronous communication. As we know from electronic vs traditional mail, the overhead of communication has strong influence on frequency an nature of messages. The overhead of videograms is still too high to be considered "email-like." As part of our research agenda, we are interested in investigating the situation where this is no longer true. In the meantime, videograms are still in use when a project demands high interaction or has special needs, or when users are motivated (by either early enthusiasm or technical aptitude). .
Five VCRs were connected to the central switch were controllable from the A/V server. In order to utilize these machines from local offices, such as to read or create video mail, Hugh Messenger built a prototype application. The software takes the form of the virtual VCR control panel illustrated in Fig. 8. Besides the standard functions, the panel permits the choice of which VCR is to be controlled and permits the user to determine the current location (in reference to its time code), and to cause it to go to a specified location (also expressed in terms of time code). Figure 8: Virtual VCR Control Panel. The control panel permits the user to control a remote VCR from their local workstation. All common front panel controls are available in a familiar representation. The user can select which VCR is to be controlled. Multiple users may have such a panel active, thereby enabling shared control of a single VCR. This is used, for example, in cases where two or more people at different locations are viewing g a particular tape. The button on the panel labelled MARK deserves special attention. This enables the viewer to mark specific points on a tape during playback. Each time the button is pressed, the system records the current location of the tape, using time-code. Feedback is provided by way of a small form that is attached to the bottom of the control panel. A number of these forms, which we call tags, are illustrated in Fig. 9. Each tag has fields that contain the start and end times of the marked section (expressed in time code), a text field in which annotations can appear, and a GOTO button that permits the viewer to navigate directly to the start of a marked section of the tape. Using these video controls, more than one client workstation can simultaneously control a single VCR. Therefore, people at remote sites can watch the same tape, have voice communications among themselves to discuss it while it is playing, and anyone of them is able to stop, pause, rewind, etc. the tape themselves, since each may have a virtual control panel for the VCR on their own workstation. Figure 9: Marking and tagging locations on a video tape. Tapes can be indexed using the MARK function. This generates a form which contains the location, annotation, and controls to access the indexed location. One of the problems that is quickly noticed in conventional videoconferencing is the lack of eye contact. Furthermore, some people, expressed dissatisfaction with video links in that it was difficult to tell if anyone was looking at you. Figure 10: The Reciprocal Video Tunnel. Through the combination of a mirror and half silvered mirror, there appears to be direct eye-to-eye contact. The mirrors effectively place the camera right in the line of sight. A close approximation to reciprocal eye contact can be obtained if both parties are using such an arrangement. To address these issues, Randall Smith and William Newman started to explore ways in which they could configure their monitors and cameras. The result was an arrangement that employed a technique borrowed from broadcast teleprompters. The technique is shown diagrammatically in Fig. 10. Effectively, the arrangement places the camera optics in line with the monitor. This is done using mirrors. The mirror in front of the monitor is half silvered. Consequently it does not obstruct the view of the monitor, yet still provides the reflective function for the camera. A number of boxes using this approach were constructed. These were called video tunnels. Fig. 11 shows a desk with a workstation and a video tunnel. Note that the camera is hidden inside the box. 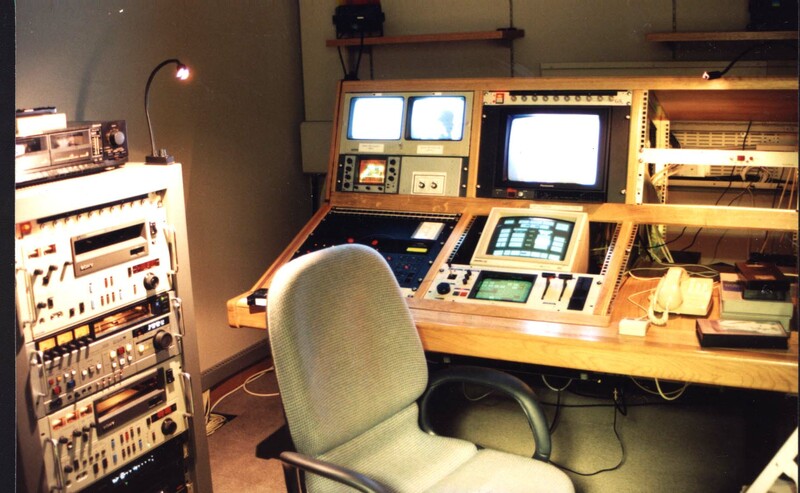 The figure shows the desk of Randall Smith, holding his workstation (left screen) and one of the Video Tunnels (right screen). An approximation of eye contact can be obtained in 2-way conversations. The camera is hidden, thereby eliminating part of its common "big brother" associations. Because the monitor is recessed in the box behind the half-silvered mirror, there is a tunnel effect that means that the angle (range) of from which the monitor can be viewed is about the same as the range of view of the camera. Thereby, a primitive "If you can see me, I can see you" ethic is enforced. As a corollary of the previous point, the optimal position for view by the camera is also the optimal viewing position of the monitor. This is subtle but important. The reason is that people seem to be intuitively aware when that they are visible and properly framed. Unlike most other video conference systems, users are generally comfortable without an additional "confidence" monitor to let them see themselves as others see them. Figure 12: Video Configuration of the SharedARK Experiment. The video connections of the experiment are shown. The white regions indicate the separate rooms. Equipment in subjects rooms are connected to the network via the local wall panel. All signal routing is controlled by the central A/V switch. The A/V suite is used as control. The PIP (picture in a picture)unit combines the four channels of video into one frame, one channel of video per quadrant (as shown in the next figure).The only non-standard part of the physical configuration are the two extra cameras used to view the subjects' screens. All connections are made by software. One of the first and most demanding uses of the system was a series of experiments to explore joint problem solving at a distance. 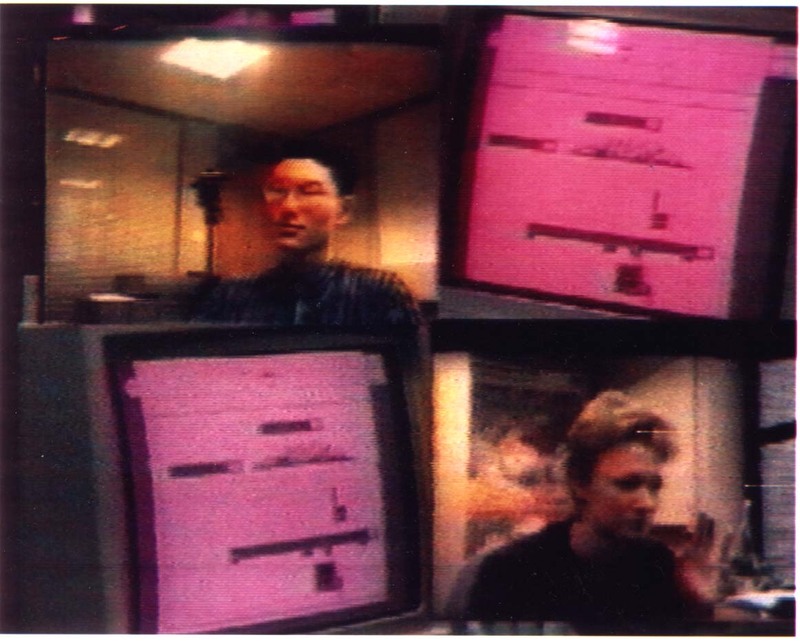 The experiments used the SharedARK environment in combination with a pair of video tunnels (Smith, O'Shea, O'Malley, Scanlon & Taylor, 1990). The video component of the A/V configuration used in the experiments is shown in Fig. 12. (The audio set up was similar.) In the experiments the A/V suite was used as the control room. Subjects were placed in separate rooms. Each room has a standard A/V node set-up, with the camera/monitor pair for each taking the form of a reciprocal video tunnel. An additional camera was installed to capture an over-the-shoulder shot of each subject's computer monitor. The signal from these cameras were routed to the the A/V suite via the room's local wall panel. All audio and video signals were routed to the control room under software control (with the video tunnel signals also sent between subjects to maintain the link). In addition, voice communication was provided among the control room and both subjects, thereby permitting the experimenter to monitor what was going on and intervene if required. Finally, all four channels of video and two channels of audio were combined and recorded in a synchronized manner on a single tape (one video channel per quadrant of the frame). The video channels were combined using the picture-in-a-picture capability of the A/V suite. A sample frame from the resulting video is shown in Fig. 13. The SharedARK experiment involved four channels of video, as illustrated in the previous figure. These were combined onto one channel for analysis. The top right quadrant show's the top left subject's screen. The bottom left quadrant shows the bottom right subject's screen. The subject's video monitor showed a full-screen view of the other subject, only. The only nonstandard component of the set-up were the two "over the shoulder" cameras. All connections were made through software, and once defined, the entire experimental configuration could be set-up in about twenty minutes! In later experiments, nonspeech audio was added to the SharedARK setup. This work was done in conjunction with Bill Gaver (Gaver & Smith, 1990). In this case, Gaver designed distinctive auditory icons (earcons) for each class of user action. These earcons provided a form of auditory "footprint" which provided auditory feedback on their own and other's actions. (The usage here can be thought of much like the case where you are working on some foreground task, and hear someone in the background making tea.) When two people were working together (but at a distance), the other person's sounds were made to sound more "distant" than those made by oneself. Consequently, sound conveyed both action type and causal agent. Our approach to using sound was ecological, where we tried to use sounds in an everyday way to convey a sense of the state of the building and activities within it. A concrete example of this is the use of sound in the glance operation, seen earlier in the discussion of Buttons. Our first approach to the system was that video links should be reciprocal: if you can see me, I should be able to see you. However, if I am having a meeting in my office, your appearance on my monitor could be an intrusion similar to your walking in and interrupting the meeting. An alternative approach was afforded by the use of sound. In this case, when you glance into my office, I hear the nonintrusive sound of a door squeaking, and when your glance terminates, I hear the sound of a door gently closing. In addition, optional cues are available to identify who had done the glancing. Our exploration of the use of sound to support copresence and other activities is ongoing. These brief examples give a sense of our direction. Of central importance is the power that is afforded this exploration by the combination of the audio distribution network, sound equipment and server software provided by iiif. In undertaking iiif, we knew that the technology which we were employing was verging on obsolete. The cable and analogue technologies are bound to be replaced by digital techniques, fiber optics, and high speed LANs. For example, our neighbors at Olivetti's Cambridge Research Lab already have a prototype system (Pandora) that distributes digital video to workstations using the same high-speed LAN that they use for other conventional services. We had no vested interest in developing technologies, per se. Our interest was in usage, and having usage drive the engineering rather than the other way around. Hence, we wanted to get up to speed as quickly as possible with whatever technology that would enable us to do so. While obsolete technically, the technology that we chose worked, was understandable, and was available. In short, we wanted to learn to do smart things with stupid technology today, rather than wait and do stupid things with smart technology tomorrow. As long as the technologies that we used could (in classic Wizard of Oz tradition) emulate the behaviour of future systems to the user, it made no difference how it was actually implemented (assuming the implementation was transparent). Before going into details, there were a few rules of thumb which guided much of the equipment acquisition. PAL is the in-house video standard (because we are a European lab). VCRs should be multistandard: the only exceptions are the field recording and editing decks, which are available only in PAL. Video Monitors should be multistandard. SMPTE longitudinal time code would be used and must be able to be be distributed anywhere in the building from a central "master" source. VCRs should all understand time code. VCRs should be computer controllable, including all front panel controls and time-code referenced autolocate. Time code should be available to computers so that time-stamped data can be on the same time reference as data collected on video and audio tape. A central house sync signal should be available throughout the building in order to genlock cameras, etc. All cameras should be genlockable. The basic architecture of the A/V distribution system is illustrated in Fig. 14. Here it is seen that the system is connected in a star configuration. The hub of the star is is the central A/V switch, or "exchange". Cables connect the hub to about 25 offices, 3 commons rooms, and the conference room. There is one cable per video signal. No broadband or multiplexing is used. The standard setup has 4 baseband video lines and 6 audio lines running between each location and the switch. These are unidirectional, and are split evenly between directions (video: 2 coming / 2 going; audio: 3 coming / 3 going). Some rooms, such as the conference room and the A/V suite have extra cabling. In total, the hub has 77 incoming and 77 outgoing video lines, and 140 incoming and 140 outgoing audio lines. Audio and video signals are distributed in a star topology between a central hub to user nodes. Normally there are 4 video lines (2 in each direction) and 6 audio lines (3 in each direction) between each node and the hub. There are 32 office nodes connected to the central hub switch. All audio and video cables are distributed in the ceiling in the same cable troughs as the telephone lines, mains power lines, and ethernet cables. To avoid interference, the audio and video cables were kept as far as possible from the others. Furthermore, the best quality broadcast cable available (i.e., the best shielded) was used for video. Audio lines are all shielded, balanced, and low impedance. Despite long cable runs, extending over the three stories of the building, no problems of cross talk, interference, or grounding loops were encountered. The A/V switch at the hub of the system is not a single cross-bar. While ideal, cross-bar switches of that capacity would have been too expensive. Rather, the approach taken was to employ a number of smaller cross-bars, and provide some communications capacity among them. Two different switches were used in the system: the D2000 which has 16x16 audio and 16x16 video, and the D3200, which has 32x32 audio (no video). There are currently 7 D2000 switches and 3 D3200 switches. Some inputs and outputs from each switch are used to interconnect switches rather than to communicate to the user nodes. With the D2000 switches, this represents about 1/3 of the I/O capacity: 5 inputs and outputs for each of audio and video. Figure 15: Video switch topology. Shows 11 inputs and outputs connecting each switch to user nodes and 5 inputs and outputs used for switch interconnect. The daisey-chained approach to bridging switches was intended as temporary, to be replaced by additional interbridge switches, as in standard telephone switching techniques. The topology of the initial interconnect of the switches is a trivial daisy chain. The video interconnect is illustrated in Fig.15. This configuration is clearly inadequate except for initial testing and debugging, since there is too much potential for blocking and knock-on effects. The plan was to provide additional switches to provide an interbridge among the existing switches. This would use a slight variation on standard telephone switch topologies (Buxton, 1989). The Akai switches normally come with a dedicated controller. This is, in fact, a black box computer. For our purposes, this controller was inadequate. Among other things, it restricted control to four switches, less than half the number that we needed. Through the efforts of Mark Wilson of the BBC (one of the many collaborators who helped us bring the system to fruition), we found out that electronically, the protocol used between the Akai controller and the switches was MIDI (IMA, 1983). Consequently, all that was required to control the switch from another computer was a MIDI interface, specially made-up cables, and the logical control protocol (which we were finally able to obtain from Akai UK). Through this circuitous route, we were able to have all of the switches controlled from a single computer of our own choice. This was a Sun workstation, which now fulfilled the role of A/V server. Since the server sat on the network, the hardware was now in place to permit the switch to be controlled, via the server, from remote clients running on end users' workstations. The combined control and signal topology is illustrated in Fig. 16. The basic tools provided by the infrastructure consisted of a set of base transactions that could be performed by the server at the request of a client. Transactions were expressed in the form of remote procedure calls (RPCs). These can be initiated from any machine on the network, regardless of type or environment, as long as they can support TCP/IP protocols. Hence, control of the system could be effected from a range of different computers. Figure 16: Signal and control topology. Audio and video signals are distributed in a star topology from a central hub (thick lines). Control is distributed over the LAN, with client processes on the end user's machines communicating with the A/V server. A/V server controls hub switch from RS-232 port. Clients communicate with server using remote procedure calls (RPCs). LAN is Ethernet and Appletalk bridged. Machines connected to either can issue RPCs to server using TCP/IP protocol. Hence, server is largely computer, network and environment independent. Without going into to great detail, there were a few basic concepts that guided the design of the server software. One is the notion of ownership. The server administers all resources. When resources are requested by a client, they are delivered if available and become unavailable to others without the new owner's permission. If resources are unavailable, the server can report on their status. There are a few important consequences of this. First, some degree of privacy becomes available. Secondly, one can grab some resources, and then have some degree of a "brick wall" around them while they perform experiments. One thing that we did wrong with the software was have a blocking mechanism during service. The original concept was that RPCs would be serviced quickly. Consequently, while one was being serviced, others would be blocked. This made the code easier, but the resulting contention was more serious than expected, especially when performing real-time control of devices. It makes the switch topology invisible. It greatly facilitates updating and maintaining the switch and server. As long as I have the connectivity to get from A to B without reference to the switch, it is completely transparent to me that I am not using the same type of ring topology as the LAN. This separation between physical topology and logical topology is important if we want to explore different user models. In putting the system together, more than 2,000 audio and video connections were made. To make the system maintainable, we did two things. First, every individual cable has a unique identification number, which appears on a colour encoded number at each end. Furthermore, every connection is entered into a data base (an Excel spreadsheet), with its number, signal type (audio/video/control), direction of flow (sink/source), name of device it is connected to (eg., "JVC 6200 VCR#1"), and the specific connection of that device (eg., "audio output 1"). The resulting data base documents the complete configuration. It includes macros to check for errors such as "3 ended cables", sinks connected to sinks, etc. Most important, the database can be read by the server. When the configuration is changed, the database is updated and read by the server. The server then services requests for resources using its internal representation of the current configuration and a general path-finding mechanism. Since all connections requested by clients are by reference (i.e., device rather than the specific switch port to which that device is connected), all such changes are transparent to the user and user applications - a good thing in any evolving system. This software was written by Tom Milligan, with help from Hugh Messenger and Lennart Lövstrand. 1 colour camera: all cameras are CCD to avoid lens "burn in" and have auto focus, auto iris and can be genlocked. 1 microphone (Tandy/Radio Shack PZM mike was main choice - excellent performance and value). 1 pair of self-powered stereo loudspeakers. Being self-powerd greatly reduces cables, the number of components, and the foot-print required. 1 "wall panel" to provide the interface between the above equipment and the cables linking the room to the hub switch. Different examples of a user nodes are illustrated in Figs. 5, 11 and 17. Although 32 locations in the building were cabled as nodes, we initially purchased equipment to equip only 10 of them. This was in order to enable us to explore different types of cameras and monitors, for example, before making the full investment. Our experience has brought a number of issues to light. For example, size of monitor, position of camera and monitor, response time of control software, and lighting have a strong effect on usage. Furthermore, the importance of audio quality in conveying a sense of telepresence cannot be over emphasized. Consequently, microphone and speaker selection and placement is critical, and great care must be taken to control ambient noise from disk drives or fans, which can greatly degrade the quality of usage. Figure 17: A Miniature User Node. Typically users employ different configurations as well as different types of monitors, cameras, etc. One aspect of the research is to develop an understanding of the implications of such variations. Two configurations have been seen in previous figures. The example in this figure shows a miniature system which occupies minimal space on the desk-top. Because of its size, the angle from the eye to the camera and monitor is sufficiently small that eye contact can be established without the need to revert to the complexity of the video tunnel. On the other hand, while adequate for "talking heads" type conferencing, the monitor is not large enough to view videotapes in detail. Gaining experience and developing an understanding of these types of trade-offs was a major objective in our work. One of the strongest messages conveyed to us from Steve Harrison of the Mediaspace group was the fact that every device has a different type of connector, and the availability of the suitable adaptor was inversely proportional to the square of its need. To minimize some of these problems, we took special care in designing a standard wall panel, illustrated in Fig. 18, to terminate the cables in each office. The main purpose of the panel is to handle some of the problems associated with connectors and the vagaries of audio. The panel can accommodate almost every signal type and connector type that can reasonably be expected. It can handle signals that are balanced and unbalanced, high or low impedance, mike or line level, and 1/4" phone, phono (RCA) or XLR connectors. Regardless of input or output level, type, or connector, the panel makes sure that all audio signal traffic between it and the hub switch is low impedance balanced line level. The unit has a variable gain mike preamp selectable on each input, and one input has a voice activated switch which turns off the local speakers whenever (and for as long as) the input is above a user settable threshold. This helps prevent audio feedback. Even more than cameras, microphones can be an objectionable source for invasion of privacy. For example, "ear dropping" on a private conversation with a microphone is far more serious than "eye dropping" with a camera. This in itself is not news. To handle this, out initial approach was two-pronged: not to have microphones in pubic spaces, and to give users access to manual on/off switches on the microphones in their private spaces. Figure 18: Wall Panel, Mk II. The wall panel is the interface between the cables to the hub switch and the cables to the equipment in the user's node. Redundant audio connectors of different types are provided, as well as phantom power for condenser microphones, mike preamps, a voice activated switch to avoid feedback, and other features. Nevertheless, users still continually forgot to turn their mikes off. Furthermore, when visitors were in an office, they had no way of knowing the microphone status. Consequently, in the second version of the wall panel, we addressed this issue as follows. First, we added the capacity for a foot-pedal operated on/off switch for the microphone (such as used for the sustain function of an electronic piano). When the pedal is used, audio is passed through the microphone preamp only when the pedal is depressed. Hence, the user must take a deliberate and inherently temporary action to activate the mike. Secondly, there is a connector that permits a light to be attached so that a red "recording" indicator can be easily connected. Five VCRs are under control of the A/V server. The full functionality of these machines, including time-code functions such as automatic locate, are accessible from client machines, over the LAN. Audio and video inputs and outputs of the VCRs are connected to the central switch, and can therefore be accessed from individual nodes via their wall panels. As described earlier, there are a number of VCRs available for use from the client workstations. Two are permanently on line, and three are switchable between being on-line or being under the control of the computerized editor in the A/V suite. The audio and video outputs of these VCRs are connected to the hub switch. Their functionality is controlled by the A/V server software using RPCs from the client. Each machine can be individually addressed. Functions available include autolocate, since the interface handles the time code on the VCR being controlled. Control is effected through the use of a Videomedia VME "video LAN", or VLAN. This permits up to 16 VCRs to be controlled from one RS232 port. The logical relationship of these VCRs to the overall system is illustrated in Fig. 19. The A/V suite is a special node, in that it has a great deal of specialized equipment. This room presented one of the largest design challenges of the system: could one room meet the needs of the video literate "power user" and still be usable by the novice. Based on our experience, the answer is yes, but just. To do so requires careful selection of equipment, its layout and presentation, and training. We did a few things to make the room manageable. First, any equipment not needing hands-on attention was moved to the server room. Second, we concentrated on computerized reconfigurable equipment. As a result, the user can go through an initial procedure and be reasonably confident that the equipment is in a standard "default" condition. This includes our placing a small red marker to indicate the default position for virtually every manually settable switch. Finally, we spent a fair bit of money on furniture to house the equipment. This not only helps the ergonomics, but hides a great deal of cabling and complexity. With the emergence of inexpensive consumer-level video editing equipment, it is likely that we would now take a different approach to this part of the system. A centralized approach to video editing is in conflict with the notion that video is just another form of document. If video is a document, then we should be able to perform transactions on it from our everyday workstation. As with text and graphics, this implies the ability to author, read, edit, annotate, index, transmit, save and retrieve such documents. It also means providing the ability to process hybrid documents. Just as we can now cut and paste between graphics and text processors, we should be able to easily include audio and video elements. While a central A/V suite has many uses, we feel that many of the services that it is intended to provide are now technically and economically feasible to integrate into the local workstation, thereby providing a far richer environment for exploring the use of these new enriched documents. Like many systems, the one under discussion is still under development. Regardless, it is in daily use and is, to a large extent, becoming invisible as it becomes absorbed into the basic working environment of the lab. Following the path that we did came at a price. Based on how it has been used, despite its problems, we believe that it was worthwhile. We also believe that many of the services that it provides us in supporting our work will eventually become fairly common. We hope that this sharing of our experience will help others benefit from what we did right, and avoid some of the pitfalls where we stumbled. We would like to acknowledge the help of our colleagues at EuroPARC who helped make the realization of these ideas into a working reality. Hugh Messenger, Lennart Lövstrand, Richard Southall and Tom Milligan deserve special mention. In addition, Michael Brook has been invaluable in providing expert advice in the planning the system and in conducting training workshops for the lab. We also gratefully acknowledge the help, advice, support and encouragement that came from our counterparts at PARC, especially Mark Chow and the Mediaspace team, including Steve Harrison, Sara Bly, Karen Weber, Scott Minneman and Bob Stults. Without them, probably none of this would have happened. Bill Gaver and Randall Smith made an important contribution as early users who provided valuable feedback and experience. Our colleagues at Rank Xerox's Welwyn Garden City site, especially Bob Wildsmith provided a lot of technical help and support in working with the satellite video conferencing link. Lucy Suchman and Gitte Jordan provided valuable input concerning the use of video in analysis. Finally, we would like to acknowledge the help of Mark Wilson and Brian Hodgson of the BBC's Radiophonic Workshop who helped so much in reverse engineering the control interface to the Akai switches. Acker, S. & Levitt, S. (1987). Designing videoconference facilities for improved eye contact. Journal of Broadcasting & Electronic Media, 31(2), 181-191. Buxton, W. (1989). Upgrading the A/V Switch Topology. Unpublished report. Cambridge: Rank Xerox EuroPARC. Buxton, W. (1989). Introduction to this special issue on non-speech audio. Human Computer Interaction, 4(1), 1-9. Buxton, W., Gaver, W. & Bly, S. (1990). Introduction to the Use of Nonspeech Audio in User Interfaces. CHI '90 Tutorial Notes. New York: ACM/SIGCHI. Gaver, W. (1986). Auditory icons: Using sound in computer interfaces. Human-Computer Interaction. 2, 167 - 177. Gaver, W. & Smith, R. (1990). Auditory icons in large-scale collaborative environments. Unpublished manuscript. Cambridge: Rank Xerox EuroPARC. Harrison, S., Minneman, S., Stults, B. & Weber, K. (1990). Video: a design medium. SIGCHI Bulletin, 21(3), 86-90. Heath, C. (1986). Body movement and speech in medical interaction. Cambridge, UK: Cambridge University Press. Loy, G. (1985). Musicians make a standard: the MIDI phenomenon. Computer Music Journal, 9(4), 8 - 26. MacLean, A., Carter, K., Lövstrand, L. & Moran, T. (1990). User-tailorable systems: pressing the issues with buttons. Proceedings of the ACM/SIGCHI Conference on Human Factors in Computing Systems, CHI '90, 175-182. Moran, T. & Anderson, R. (1990). The Working environment as a paradigm for CSCW. To appear in the Proceedings of the the 1990 Conference on Computer Supported Cooperative Work, Los Angeles. Smith, R., O'Shea, T., O"Malley, C., Scanlon, E. & Taylor, J. (1990). Preliminary experiments with a distributed multi-media, problem solving environment. Unpublished manuscript. Cambridge: Rank Xerox EuroPARC. Stefik, M., Foster, G., Bobrow, D., Kahn, K., Lanning, S. & Suchman, L. (1987). Beyond the chalkboard: computer support for collaboration and problem solving in meetings. Communications of the ACM, 30(1), 32-47. Stults, R. (1986). Media Space. Systems Concepts Lab Technical Report. Palo Alto, CA: Xerox PARC. Stults, R. (1988). Experimental uses of video to support design activities. Technical Report SSL-89-19. Palo Alto, CA: Xerox PARC. Trigg, R. (1989). Computer support for transcribing recorded activity. SIGCHI Bulletin, 21(2), 72-74. [1 ] A Sampler is effectively a modular digital audio recorder/player. One can store a number of short sounds in the device, and then play them back on demand under computer control. As its name suggests, a synthesizer generates synthetic sounds. In contrast, samplers are well suited to playing back natural sounds, thereby expanding the sonic palette available in our research.